I hope you all had a great start in the week. I am still trying to find out if I can leave work before the given term of notice, which is in my case three months. For the ones who wonder, I am totally changing my direction and won't be seeking an employment by another company. This is not all about getting more money or a position at all. I will write more about that in another post, but for now hoping (praying) that the termination works on time. On another note, today is the International Kissing Day. Happy Kisses! 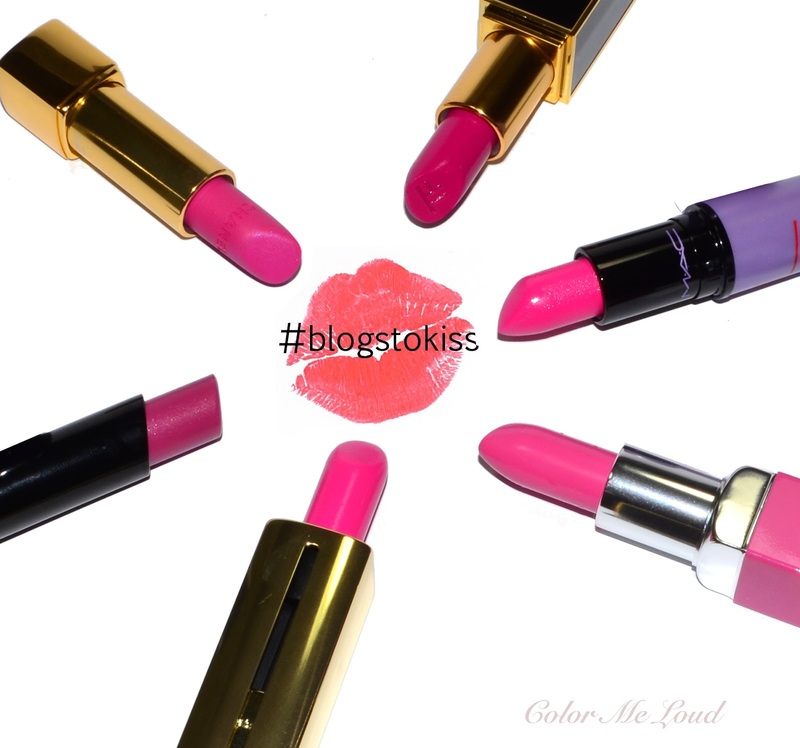 I don't know how it is being celebrated elsewhere but with fellow bloggers we agreed upon #blogstokiss posts for today. We all write about our most loved lipsticks and formulas. I have a link to the other reviews at the end of this post, go and show them some love too. 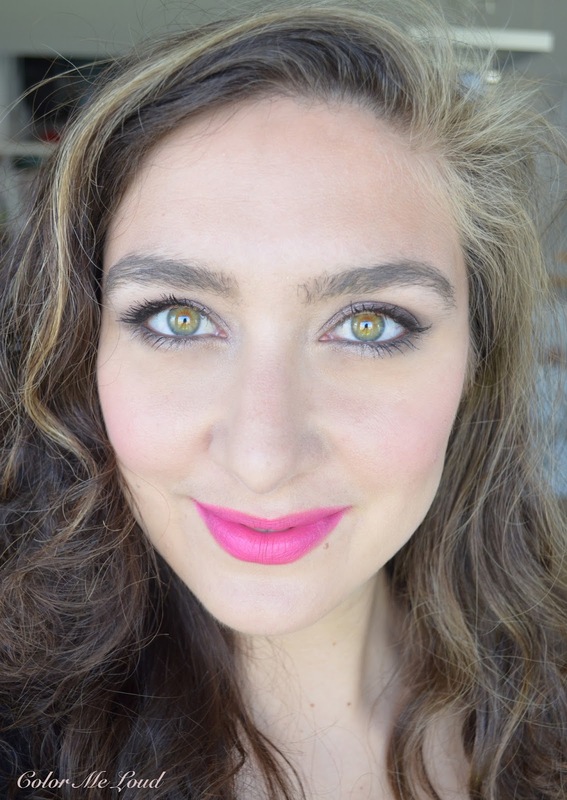 I would like to talk about six of my favourite formulas in my favourite shade for summer, hot pink! Do you also have the feeling that you can't get enough of things you like? I have a few red nail polishes and feel good about skipping another one saying "oh that is close enough" but I can't skip a turquoise nail polish because it is different enough for me, although for many others it would be so similar to another one I own. This is why my hot pink lipstick part of my stash is constantly growing. They might look similar but to me they are all different enough to keep. Bobbi Brown Sheer Lipcolor in Berry is the most berry leaning hot pink I own. I have reviewed it formerly here. It is a lovely hydrating and semi sheer lipstick which packs a good amount of pigment. If you like light weight lipsticks with a good slip and a good color pay-off, you would like this one. Guerlain Rouge Automatique is one of my all time favorite lipstick formulas. I love how convenient the packaging is. It is genius, doesn't open in your bag. Oh and if you are in danger, you can try to act as if this were a knife, worth trying. Love the color offering from the Summer Collection, Fluo Stiletto, reviewed it previously here. It is the most fuchsia of them all with a nice hint of blue, lovely. Chanel Rouge Allure Velvets offer a nice formula between matte and satin, a good thing if you like matte lips but find a real matte to be very drying on you. This chic click click packaging is a head turner at the bathroom and this shade is so bright, make sure your friends are wearing sun glasses! MAC Kelly Yum Yum was a limited edition shade from Osbourne's collection (reviewed here). It is very close to a permanent shade called Candy Yum Yum though, which I have on my wish list. Kelly Yum Yum has a satin finish, Candy YY is matte, which is even better but need to check it out before buying to make sure it is not one of the drying mattes of the brand. Anyway... Can't get enough of MAC lippies. They make the most unique colors and when I wear one, my husband says "oh today you are wearing a MAC lipstick" and most of the time it is right! Clinique recently made a killer release, Pop Lip Color + Primers. You can find my review on four of the shades here. 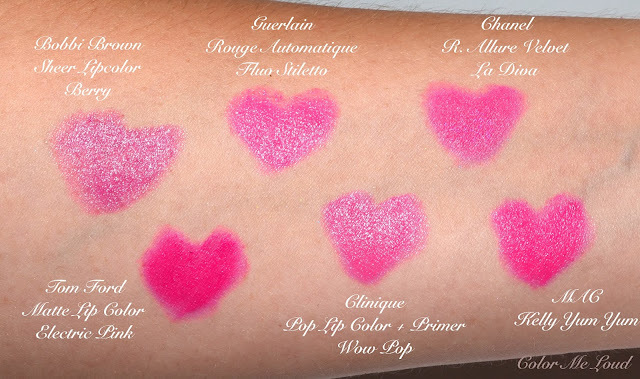 Wow Pop is a beautiful bright pink, which hydrates and lasts well on the lips. In fact I like the formula so much, went ahead and purchased more shades. I also find the idea of the colored package great. Finally I can grab the right color despite my half closed eyes in the morning! Wow pop is one of the most wearable bright pinks I have. Tom Ford Electric Pink is one of my latest obsessions. I have reviewed it just yesterday here. If you are shy of bright colors and hot pinks, matte is the way to go. This one lasts and lasts and it doesn't dry my lips despite the finish. Big love! I would like to include an FOTD for all these shades for you but this plan had to be canceled as we hit 40°C here. I wouldn't like my most beloved lipsticks melt or break. Even for the swatch above, I had to wait until it cooled down to 30 something at night. Today it was only(!) 32°C. A commentary on the radio made me laugh out loud while I was driving to work. He said "man, it feels like Siberia today but don't worry we will be back to normal tomorrow!". I am definitely planning a bare face day tomorrow! What is your favourite lipstick shade for summer? Do you celebrate International Kissing Day? Disclaimer: MAC Kelly Yum Yum and Chanel La Diva were purchased by me. Other products in this post were provided free of charge for my consideration. Das sind wirklich mal Hot Pinks! Eine sehr hübsche Auswahl. Nur leider traue ich mich viel zu selten an so knallige Nuancen, da ich am Ende doch immer zu was Gedecktem greife. Dir steht es aber klasse! I came here to say more or less the same thing. I don't think your eyes look crossed and I have a few theories about your what your new job might be. :-) Electric Pink looks great on you! I love corals in the summer and pinky corals even more! But I am more of a gloss girl from June to September I'd say! I love a juicy shine on my lips. Love the colors here and no cross eyes at all! The heat is about the same here. Very humid too. I just can't wear any makeup. I've just been using my Dior Glow on my lips for a little color and that's about it. Oh, large hats and huge sunnies. It's crazy! If I could, I'd bring a portable fan. LOL! Knalliges Pink passt wirklich perfekt in den Sommer! Deine Lieblinge sind wirklich schön gewählt. Ich trage so intensive Farben leider viel zu selten. Super tolle Farben! 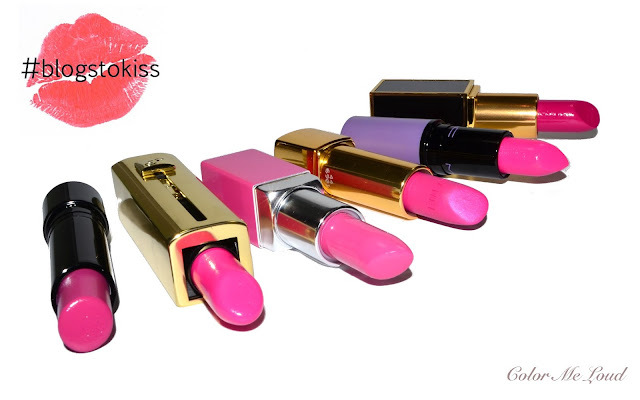 ♥ Ich habe mich gerade ein bisschen in Electric Pink von Tom Ford verliebt. Wow! Vielen Dank Franzi. Dir würde auch stehen. Ich habe jahreslang keine knallige Farbe getragen, jetzt mag ich sie irgendwie mehr. I wonder what you think about the new job. With both eyes I looked at the camera so they are looking a bit inward (where the camera was). Hahaha horrible blogger cracked me up so bad. I wish I could wear gloss as well, looks somehow off on me. Maybe I am not used to it. And it catches my hair, ugh. It is not limited, so you can grab it whenever you feel like. :-)) Blogparaden sind immer sehr gefährlich. Wegen euch habe ich auch mehrere Lippenstifte auf meiner Wunschliste eingetragen. I believe you guys are at least prepared for heath and humidity. We, not! Even the air conditioning at work didn't work properly, too much unexpected load. Hahaha aren't these like knives? ;-) You cracked me up too with "do you want to mess with my Stiletto" hahaha I would run away at no time. Very dangerous you and your Fluo Stiletto!!! Oh good! She's coming in August. I have approached full-on waddle stage!! Yes we are excited!! It's our second, we have a 2 year old too :) I sure will!